Raise your hand if you’re a growing company with increasing hiring needs, but your hiring team sees the recruitment funnel as a maze they can’t find their way out of. Now raise your hand higher if you’re attracting great talent, but candidates are slipping through your fingers because you’re unable to process them on time – great, we see you. Acceptance is always the first step towards finding a solution, so lower your hand, take a deep breath, and keep reading to see how Talentera can help you remain on top of your recruitment funnel and prioritize productivity. 1) Massive candidate backlog: As applications pile up in the various stages, recruiters have their work cut out to ensure that pipeline keeps moving without risking losing the applicant’s interest. 2) Slow time-to-hire: With more delays in processing suitable and high potential candidates, you inadvertently raise time to hire, and also risk of top candidates abandoning your process. 3) Disinterested candidates: Candidates want to be kept engaged; throw them in the darkness with no communication and you’re bound to lose precious talent due to visibly poor hiring practices. So the problem’s been identified, how do we solve it? Wouldn’t it be great to have someone to notify us exactly when an application isn’t getting attention? What if we could identify applications that have been sitting in the pipeline for far too long, and then understand where things fell through the crack? Talentera strives to improve hiring velocity and employers’ performance standards so that no application goes untouched, and is processed in a timely fashion. How? This is done by adding a service level agreement or SLA on each stage of your hiring funnel. You can indicate the maximum time before which the application must be progressed from that stage. Talentera will monitor the HR SLAs and flag applications whenever they’re going stale. So what is an SLA? 1) A Warning indicating that the SLA is close to failure, so time for prompt action by the recruiter. 2) Failure meaning violation has happened, and the SLA was not honoured by the recruiter. 1) As an Admin (or user with the SLAs permission) navigate to the Admin Panel. Here you’ll find the new Recruitment SLAs section. Select “SLA Management“. 2) You’ll see any previously created SLAs, along with the option to add new SLAs. 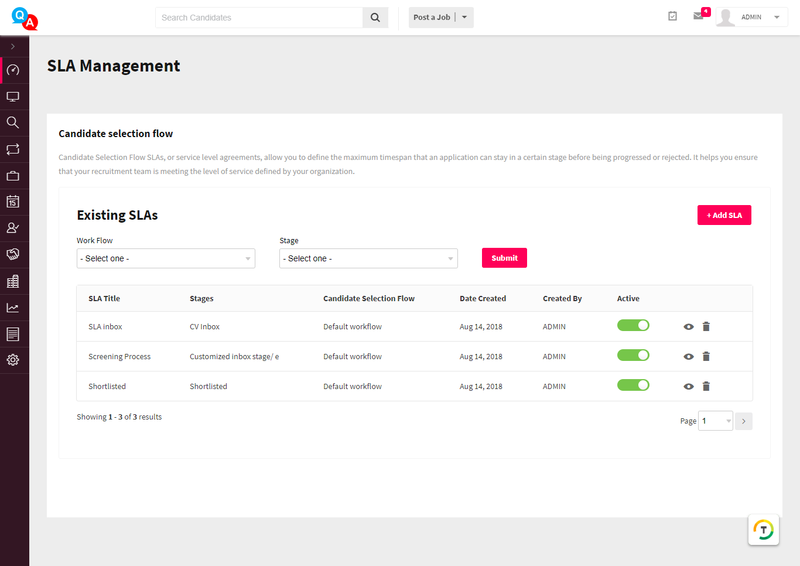 3) After clicking “Add SLA“, you’ll be required to add an SLA Title, select the Hiring Workflow, and select which stage this SLA will be used in. 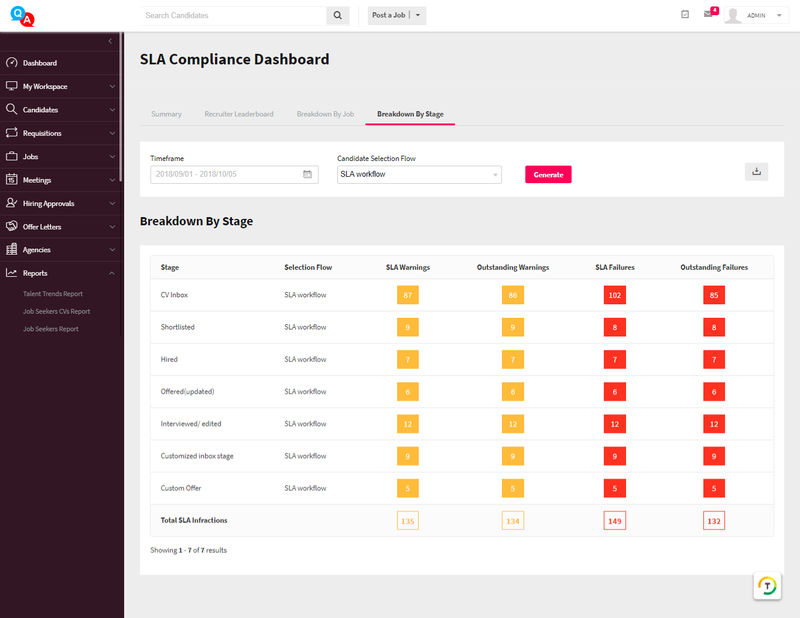 Once done, users will choose the Warning and Failure settings associated with the SLA. Defining an SLA Warning is done by setting the time an applicant is allowed to remain in the specified stage (before a warning is raised). This will notify the recruiter responsible for processing the application that the candidate is close to failing its SLA, and consequently trigger a Warning. Users can opt to receive all SLA Warnings immediately at the time the warning is triggered, or by receiving an email at the end of the day of all warnings raised throughout the day. 4) Next, users will choose the Failure settings associated with the SLA. 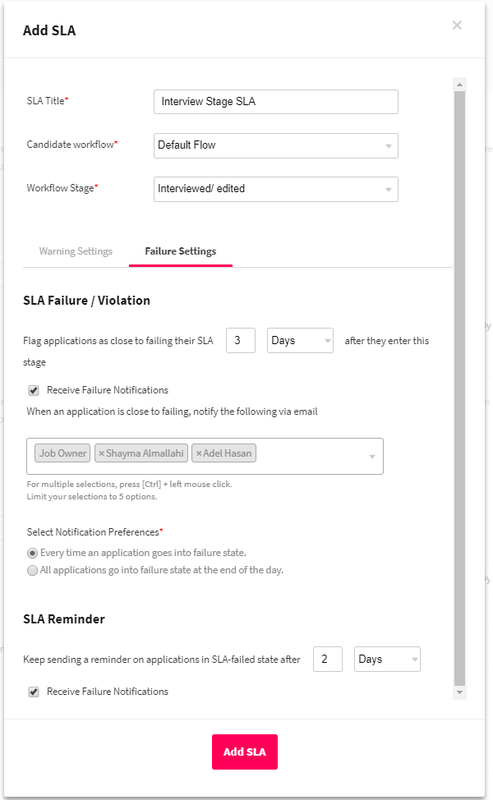 Defining an SLA Failure is achieved by setting the time an applicant is allowed to remain in the specified stage, before the SLA is considered to have failed. 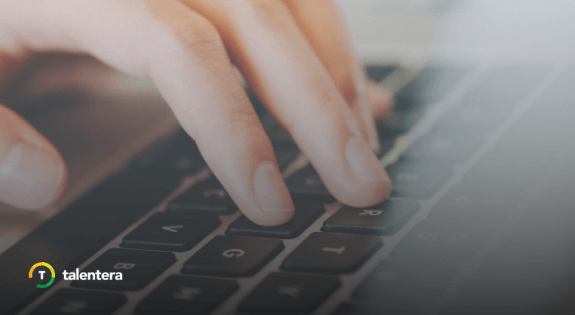 This will notify the recruiter responsible for processing the application that they have failed to move the candidate in accordance to the SLA set, resulting in a Failure. Just like Warnings, users can opt to receive all human resources service level agreement Failures at the time the failure is issued, or by receiving an end of day email of all failures raised throughout the day. They can also opt to be reminded every “X” number of days until the failed SLA is resolved. Let’s say an SLA is set for the “Interviewed” stage. As an admin you’d like your recruiters to process any applicant that enters this stage within 3 days, otherwise you’d consider it a Failure. Considering there are 3 days until Failure, you can set a Warning state once the candidate has remained in the stage for 2 days without being addressed. This way, your recruiters will get a heads up to avoid Failing the SLA for that candidate. If the candidate is processed within the 3 day period, then the candidate is moved in accordance to the recruitment SLA, and the recruiter will not be issued any Failures. 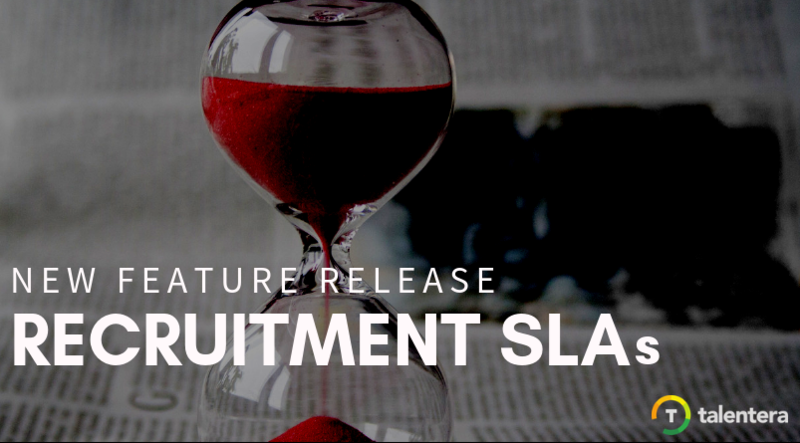 However, if the recruiter fails to address the candidate within the 3 days time limit set, then they would be flagged with an SLA Failure. 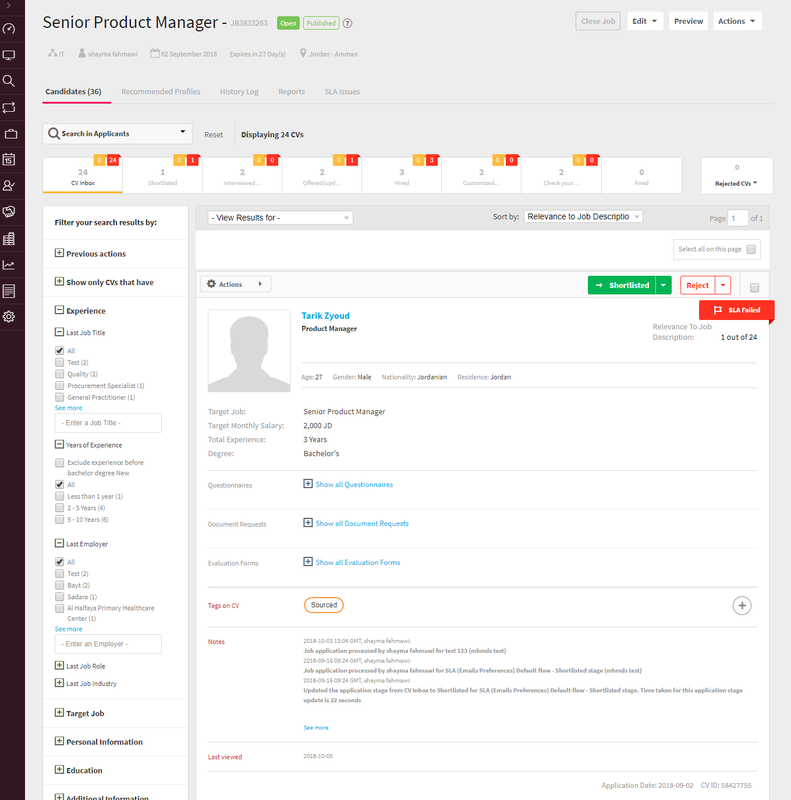 5) So how can recruiters check at a glance which candidates are close to Warnings or Failures? Great question! 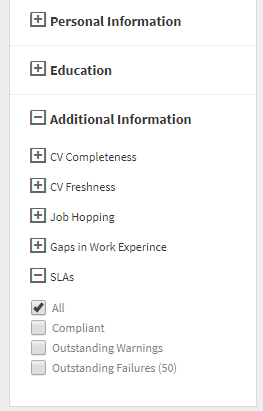 On “My Jobs” page, they’ll see SLA flags on each stage (that has an SLA applied to it) indicating the volume of candidates currently in that SLA state. Yellow flags represent SLA Warnings, and Red represent SLA Failures. 6) For further recruiter convenience, any CVs flagged as Failed, or in a Warning state will show when viewing a CV, or while viewing applicants of a job. 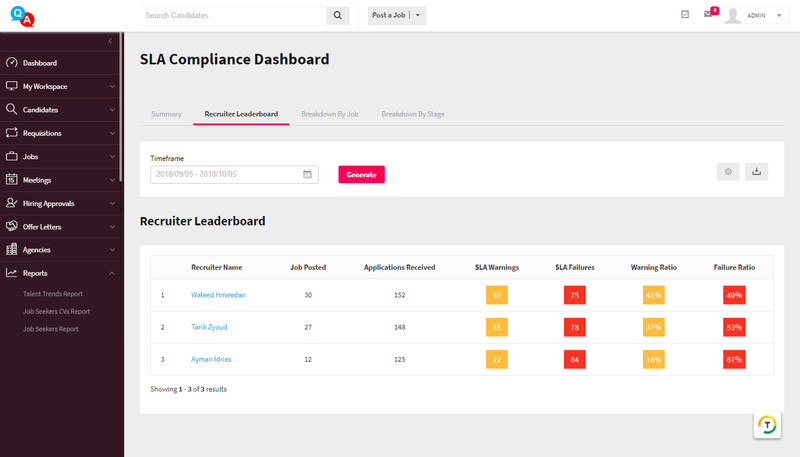 Recruiters can even filter their applicants by using the search filters to view applicants based on any SLA flags applied to them, or whether they’re compliant or not. What gets measured, get managed– this is why Talentera’s SLA reports do a great job at keeping track of all compliance success and failures across applications to help admins, or users with the SLA Reports, gain performance insights to drive enhanced recruitment. From being able to identify and measure slack across the funnel stages, to assessing recruiter performance- these reports do a great job at helping you determine how manageable your HR SLAs are. The SLA Infractions Summary shows how many SLAs occurred over the selected time-frame. It also shows how many SLA Warnings and Failures occurred on applications, how many of them were addressed, and how many of them are still outstanding. 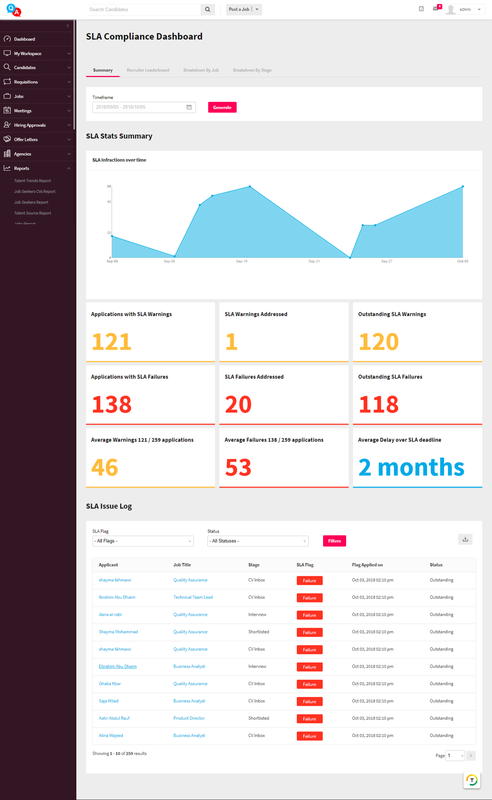 Then we calculate the average amount of Warnings and Failures per application, along with the average delay recruiters are taking to process applications in accordance to the SLAs set on them. Also, we have the SLAs Issue Log. This shows the latest SLA flags to be raised, and to which applicant, job, and recruiter they belong to. Admins can see which recruiters are performing the best overall, in accordance to the SLAs defined in the system. The top ten recruiters are determined by a number of factors such as how many SLA Failures/Warnings were flagged for them, and number of applications processed by the recruiter. Here you can access a list of all SLAs broken down by jobs, and job owners. 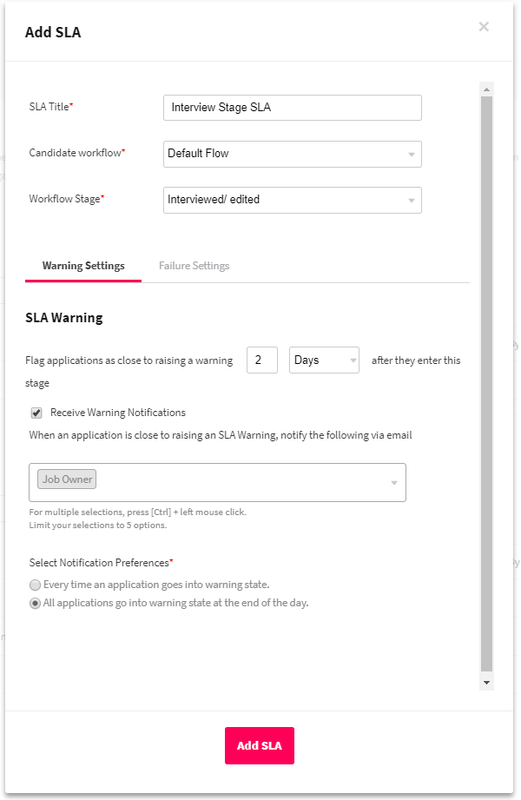 This report allows users to view SLA flags raised per recruitment funnel stage and workflow. 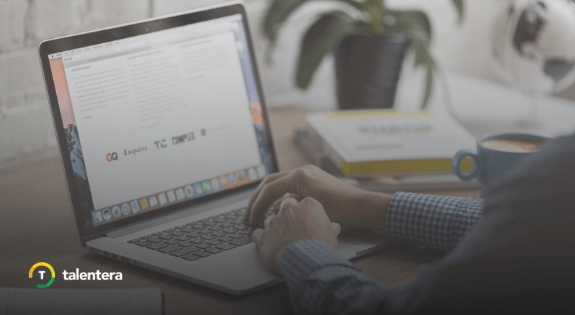 From boosting accountability, time-to-hire, candidate experience, hiring velocity and tons more, Talentra’s SLAs are jam-packed with benefits waiting to be unlocked. Helping your recruiters focus on what needs to get done right now, get ready to see your team become a productivity powerhouse. This SLA feature is available for access to all Talentera Enterprise customers. If you wish to learn more, please get in touch with your account manager as they will be happy to help.